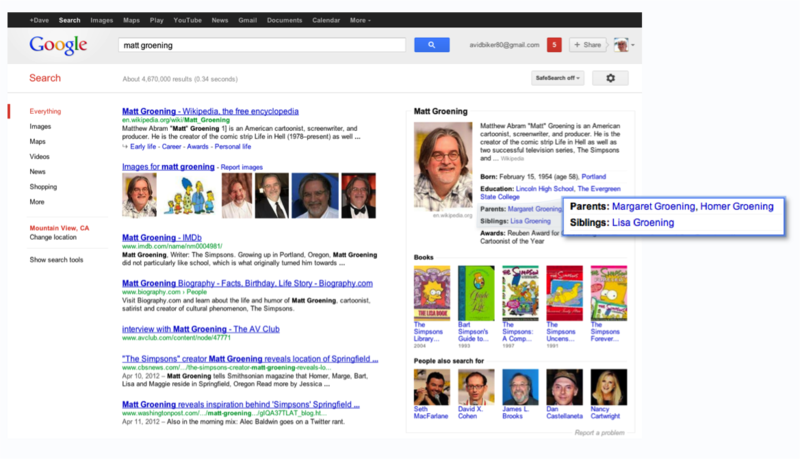 Google Knowledge Graph: The Birth of a Siri Rival? Move over, 10 blue links. Google Knowledge Graph is the search giant's latest attempt to provide direct answers in its results instead of just sending people elsewhere. The new feature, which is gradually rolling out to all users, adds boxes full of Wikipedia-like information to the search results page, covering subjects such as landmarks, celebrities, cities, media, and sports teams. The graph draws on public sources including Freebase, the CIA World Factbook, and, of course, Wikipedia. Some users started seeing these fact boxes last week, but now they're official. Google says it's not just providing factoids with Knowledge Graph. It's also drawing upon the relationship between objects to try and figure out what people want to know. For instance, the fact box for Marie Curie shows what elements she discovered, and the one for Charles Dickens shows what books he wrote, and many of these facts link to new searches on related topics. According to Google, the information that Knowledge Graph shows about Tom Cruise answers 37 percent of the next questions people ask about him. 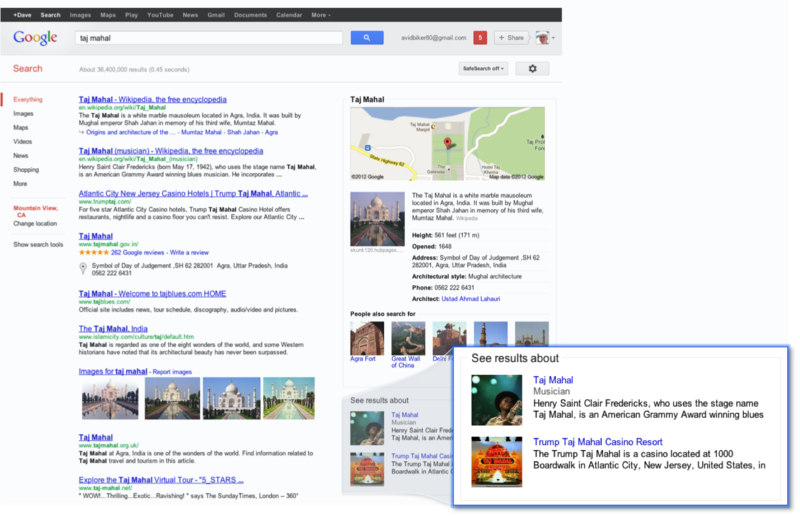 Google Knowledge Graph will also try to help when a search term may refer to more than one thing, such as "Taj Mahal" (a landmark, a musician, and a casino). For search terms like this, Google will pick what it thinks is the best result, but will show alternative searches below the fact box. Knowledge Graph is arguably Google's biggest new search feature since Google Instant launched in 2010, not counting the Google+ integration that the company added earlier this year. For users sick of social search, the company's renewed focus on improving core search is a welcome change.